Scholars of the Philippine High School for the Arts (PHSA), a specialized public high school in the Philippines offering arts-focused education located at the foot of Mt. Makiling, displayed their talents in a benefit concert hosted by the International Rice Research Institute (IRRI) at DL Umali Hall on 3 December. Bayanihandog (from the Tagalog words for “spirit of communal unity and cooperation” and “offering”) was planned by the IRRI Partnerships Office to raise funds to help PHSA repair the electric power lines destroyed by Typhoon Rammasun in July. The performances include a neo-folk dance depicting the heritage of rice culture and the traditional processes of producing rice by Sanghiyas Pangkat Mananayaw. Aninong Makiling performed Unang Sibol (first sprouts), a shadow play about an Ifugao rice myth. Maquiling Ballet performed a dance about bambanti, the Ilokano term for scarecrow. Dulaang Sipat Lawin enacted an excerpt from Paloob, Palabas—a tribute by Tim Dacanay to the Philippine national hero Andres Bonifacio and his works as an artist. Musika Ibarang and Himig Ibarang, the instrumental and choral groups of PHSA, respectively, serenaded the audience with songs and music. A poetry reading was also presented by Kuwit. In addition to the performances of the various PHSA groups, Antonio Lambino, IRRI’s head of communication and a former member of the famous Philippine pop music group Smokey Mountain, had a special participation. Mr. Lambino performed popular songs Tagalog songs from the 1990’s including Da Coconut Nut, Harana and Araw-Gabi. In his welcome remark, Bruce Tolentino, IRRI deputy director for Communication and Partnerships, highlighted the close link between the arts and the sciences. “The creative process is at the heart of scientific discoveries,” Dr. Tolentino. Representatives from the International Rice Research Institute (IRRI), Philippine Rice Research Institute (PhilRice), local government units, and state colleges and universities participated in a workshop to discuss the status of technological interventions from the drought project under the Consortium for Unfavorable Rice Environments (CURE) on 11 -12 December in Subic, Zambales. Organized by PhilRice with support from IRRI, the workshop gathered outputs and outcomes from the project Improving Livelihoods and Overcoming Poverty in the Drought-Prone Lowlands of Southeast Asia funded by the International Fund for Agricultural Development (IFAD) and eventually share them with stakeholders. These include climate change-ready rice, improved nutrient management through the Rice Crop Manager, and mechanized seed planting, among others. “When combined with good agronomic practices, rainfed rice farmer’s profited from greater productivity and impact,” said Yoichiro Kato, IRRI agronomist and coordinator of the drought project. Dr. Kato observed that farmers in 130 rainfed lowland sites in Cambodia were able to get a yield advantage of 1-2 tons per hectare when improved rice varieties were adopted with good management practices despite drought. The workshop also identified bottlenecks in the project and narrowed future targets for outscaling or upscaling of the drought-mitigation technologies. A total of 58 participants discussed the status of their milestones, ongoing activities, and outputs. The National Academy of Agricultural Sciences (NAAS) elected IRRI Director General Robert Ziegler as a Fellow of the Academy for rendering conspicuous service to the cause of science beginning 1 January 2015. Each year NAAS accords recognition to scientists at various levels, and encourages cutting edge research in different fields of agricultural sciences. The Fellows of the Academy, recognized for their contributions to science, include distinguished personalities in the field of agriculture and allied sciences, both from India and abroad. NAAS aims to gain a recognition as a credible think tank to provide views of the scientific community on all agriculture-related policy issues, to encourage talent and promote excellence in science, making it a powerful instrument for the growth of national economy with a vibrant farm sector. The Academy focuses on the broad field of agricultural sciences including crop husbandry, animal husbandry, fisheries, agro-forestry and interface between agriculture and agro-industry. This compendium of policy notes is the result of cooperation among FAO, the World Bank, and IRRI. Across Asia, rice as food plays an important part of the human family. These policy notes seek to contribute to the ongoing policy dialogues and debates about rice and food security in East and Southeast Asia and make decision-making better informed . This compendium aims to synthesize and reframe a large body of recent literature into a readily-accessible format for public officials, business leaders, civil society, and other stakeholders involved in policy-making. 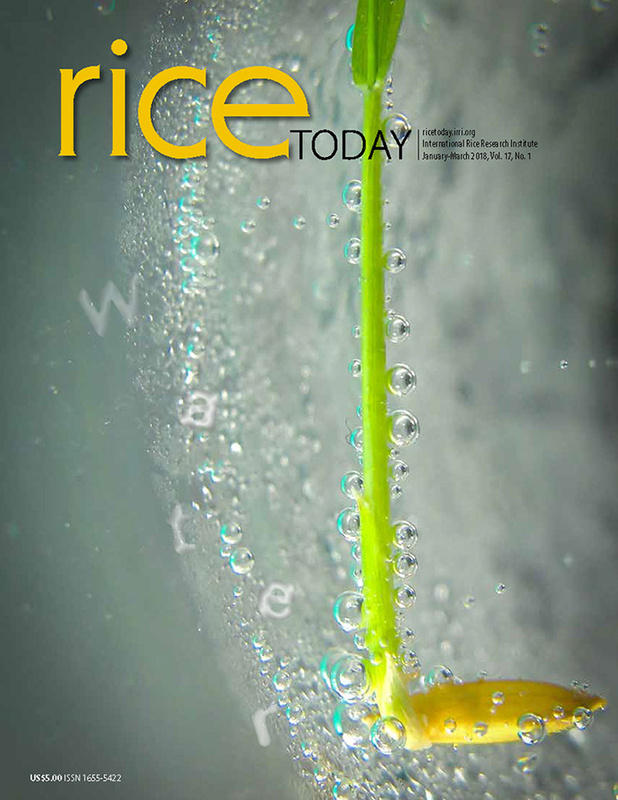 Although this publication focuses on the rice sector in East and Southeast Asia, many of its key findings and conclusions will also be of interest to policymakers who are finding solutions to similar challenges that have something to do with staple foods in other regions. The role of rice in East and Southeast Asia is shifting along with broader societal changes, including what is going on in economic structures, demography (including rapid urbanization), rising incomes, and changes in food consumption patterns. Just the same, the political economy of rice remains exceedingly complex within the region. Rice is still closely tied to food security imperatives, but increasingly also to improving the income of rice producers, realizing commercial trade objectives, and, more recently, lowering the environmental footprint of agriculture in major ricegrowing areas. As this compendium seeks to support and nurture a learning process, it also aims to contribute to more effective and efficient policies and programs. This is part of the ongoing efforts of the three sponsoring organizations to win the fight against poverty and improve food security in East and Southeast Asia through research, sharing of knowledge, strategy development, technical assistance, and boosting investments in rice-related infrastructure and management systems. Collaboration on this policy note series involved 20 authors from the three sponsoring organizations and other partner institutions. The work was initiated and led by Steven Jaffee, lead rural development specialist, Global Agriculture Practice in the World Bank, and David Dawe and Nuno Santos, senior economist and economist, respectively, in FAO. They worked together in identifying the major themes and contributing authors and they edited this publication. The PDF of the book can be downloaded free at http://irri.org/resources/publications/books/item/rice-in-the-shadow-of-skyscrapers. Providing accurate, timely, and detailed information on staple crops like rice is the basis for food security policies. This is especially important in Asia where rapid changes in rice sector policies, market preferences, land use, water availability, and climate are occurring simultaneously. Since 2012, IRRI has been collaborating with partners in Europe and Asia on the RIICE (Remote Sensing based Information and Insurance for crops in Emerging economies) project to build in-country capacity to use satellite information for rice crop monitoring in Cambodia, India, Indonesia, Philippines, Thailand, and Vietnam. In November, IRRI scientists Dr. Andrew Nelson, Dr. Tri Setiyono and colleagues published the first major scientific output from RIICE, Towards an Operational SAR-Based Rice Monitoring System in Asia: Examples from 13 Demonstration Sites across Asia in the RIICE Project. The study is the largest of its kind and was conducted in collaboration with Sarmap, Philippine Rice Research Institute, ICALRD (Indonesia), TNAU (India), GISTDA (Thailand), TRD (Thailand), Can Tho University (Vietnam), IMHEN (Vietnam), CARDI (Cambodia), GIZ-India, SDC-Cambodia and SDC-Vietnam. The article focuses on the use of Synthetic Aperture Radar (SAR) imagery which is highly suitable for detecting lowland rice, especially in tropical and subtropical regions, where pervasive cloud cover in the rainy seasons prevents the use of optical imagery. Hence, the study shows how a simple, robust, and rule-based classification algorithm can be used to map rice areas using regularly acquired, multi-temporal SAR imagery across a wide range of rice environments in Asia. The paper presents rice monitoring results from 13 study sites across six countries. Project partners conducted more than 1,900 in-season site visits across 228 monitoring locations in the study sites and a further 1,300 field observations were made for accuracy assessment. Some 1.6 million hectares of rice areas were mapped with classification accuracy at field level between 85% and 95%. The article recommends that the time is right for the development of national scale rice crop observation systems using this technology. New satellite platforms such as Sentinel-1, ALOS-PALSAR-2 and RISAT-1 can provide free or low cost imagery over Asia which can be analyzed using RIICE technologies to provide monthly information on rice area, planting dates, yield estimates, and the impact of calamities like tropical storms and drought. Such information would support governments in planning and policymaking, and other stakeholders such as crop insurance or disaster response units. It will also help IRRI and other research partners in better understanding current and future trends in rice production for better targeted research. IRRI—through RIICE Phase II (2015-2018)—is committed to working with national partners to ensure that the capacity to use this technology is developed in-country. The aim is to provide governments and other stakeholders with national scale information on the rice crop that will ultimately benefit both rice producers and consumers. RIICE Phase I has been supported by SDC and the Global Rice Science Partnership. Holy Cross Krishi Vigyan Kendra (KVK), an agricultural extension center and partner of the Stress-Tolerant Rice for Africa and South Asia (STRASA) project in Hazaribagh (Jharkhand) organized a field day featuring a rice variety demonstration of the drought-tolerant Sahbhagi dhan at Village-Khodhar on 10 October 2014. The demonstration was supervised by Holy Cross KVK under International Rice Research Institute (IRRI)-National Food Security Mission (NFSM) collaborative project in a 100 hectare area of 10 drought-prone villages in Hazaribagh district. Seed and other inputs were provided to the farmers. The farmers were also trained in quality seed production and safe storage so that they can keep the seed for the next cropping seasons and share with other farmers. Sahbhagi dhan matures earlier and requires less water than traditional and hybrid varieties, said most of the farmers who participated in the demonstration. One of the farmers claimed Sahbhagi dhan had more panicles with more number of grains as compared to other traditional varieties. The yield recorded ranged between 3.5 tons per hectare for direct seeding and 6 tons per hectare under transplanted conditions. The farmers also reported that their fields would remain fallow due to drought, but this year’s Sahbhagi dhan crop yielded enough to feed their families and livestock. Surendra Kumar Singh, District Agriculture Officer of Hazaribagh, emphasized the importance of disseminating the variety in other drought affected areas. Mr. S.K. Singh also asked farmers to take initiative to adopt the high-yielding, drought-resistant Sahbhagi dhan as a farming community strategy. Dr. S. N. Giri, deputy director of the Seed and Farm, BAU Ranchi, said that this variety is suited to mitigate drought effects under climate change scenarios. It can ease the fallow field problem during kharif season, he added. In the past, farmers cultivating longer duration traditional varieties and hybrids suffered heavy losses due to drought and scanty rainfall. The field day was organized by Mr. S.K., Dr. S.N. Giri, Dr. R.K. Singh (Programme Coordinator, KVK), Dr. D.K. Raghav, Mr. S.N. Chaudhary, and Mr. D. Rai of Holy Cross KVK. About 160 farmers from surrounding villages were also present. Under IRRI-NFSM project, 150 such field days/farmers’ awareness meetings have been organized by more than 50 partners in seven eastern states in India. An estimated 8,000 farmers, including farmers from ten drought prone districts in Jharkhand, have participated in these meetings during the kharif season 2014-15. The International Rice Research Institute (IRRI)-Myanmar office’s exhibit of its different activities, technologies, outputs, and products received the award for best stall display during the Livelihood and Food Security Trust Fund (LIFT) annual forum 2014 at Thingaha Hotel, Nay Pyi Taw, Myanmar on 25-26 November. Under this year’s theme, Knowledge sharing and ideas for Myanmar’s rural development, the two-day event brought together national and international rural development specialists from government and non-government organizations, and private institutions to support LIFT’s vision to be a collective voice for innovation and learning, and to provide a platform for policy engagement. The IRRI-Myanmar stall display featured corporate posters and best management practices in stress-prone environments, publications, videos, and 7 newly released rice varieties from the Participatory Variety Selection Trials in collaboration with the Department of Agricultural Research, and non-government partners. It bested 15 international and local non-government partner organizations of LIFT who participated in the competition based on the following criteria: (a) design and arrangement, (b) attractiveness of materials, (c) clarity of message, (d) quality of personal interaction, and e) overall impression. LIFT Annual Forum 2014 also conducted 4 sessions to discuss the changing dynamics of Myanmar’s rural economy, private sector engagement with smallholder farmers, building knowledge platform for agriculture, and rural development and increasing resilience of rural households. Experts in these four themes presented plenary papers followed by panel discussions and open forum. His Excellency U Soe Thane, union minister at the President’s Office, and Roland Kobia, ambassador of the European Union to Myanmar, gave the key messages. Attending the event were Dr. Madonna Casimero (IRRI representative, Myanmar), Dr. Romeo Labios (IRRI scientist), Dr. Ye TunTun, Dr. Nyo Me Htwe, and Dr. KhinThawda Win (IRRI postdoctoral fellows), and May NweSoe (IRRI assistant scientist). The LIFT annual forum 2014 was jointly organized by LIFT Fund Management Office and the Myanmar Ministry of Livestock, Fisheries and Rural Development.